The Forgotten Kingdom, the first feature film in Sesotho, was released in Lesotho in April prior to its South African release and was the number one film on circuit in its opening weekend. It out performed Hollywood blockbusters Captain America and Noah at Ster-Kinekor’s Pioneer Mall cinema in Maseru. The film, directed by Andrew Mudge, has also racked up a total of nine African Movie Academy Awards (AMAA) nominations, including Best Feature Film, Best Director of a Feature Film, Best First Feature Film by a Director, Best Actor (Zenzo Ngqobe) and Best Cinematography.Also among the nominations is one for Lebohang Ntsane, for Best Child Actor. The Forgotten Kingdom tells the story of Atang Mokoenya, who lives in Johannesburg, and travels home to his ancestral land to bury his estranged father. He is drawn to the mystical beauty and hardships of the land and people he had forgotten. Atang feels like a stranger in the land of his birth, but finds an instant connection in his childhood friend, Dineo. He befriends a precocious 11 year-old orphan boy, and together they make the arduous journey across the rugged mountains to find her. Along the way, they undergo experiences that force Atang to surrender to the rhythm and traditions of the land, and to make peace with his father. A changed man, Atang finally reaches Dineo, but must overcome one last obstacle to win her father’s approval. 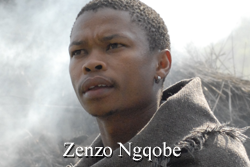 The role of Atang is played by Zenzo Ngqobe, a South African actor known for his starring role as Stone Khuse on the television soapie Rhythm City. The cast includes stars like Nozipho Nkelemba, Jerry Mofokeng, Moshoeshoe Chabeli, Jerry Phele and Lillian Dube.